Tourmaline crystals possess exceptional energetic qualities that can be employed for both physical and metaphysical purposes. They come in an array of colors including black, blue, green, pink, red, watermelon, and yellow. Each color carries its own unique variation of energy that helps facilitate physical and energetic wellness. Use them individually or in a combination of assorted colors to promote health, balance, expansion, increased psychic awareness, protection, wisdom, clarity, joy, and peace. The tourmaline family of crystals are associated with Archangels Azrael, Chamuel, Gabriel, Metatron, Michael, and Raphael. Black tourmaline is associated with the goddess Manat and the goddess Aradia, and the tourmaline family of crystals is associated with both the planets and deities Venus and Mars. Along with the shared properties of all tourmaline crystals, individual colors can be used and combined for more precise purposes. 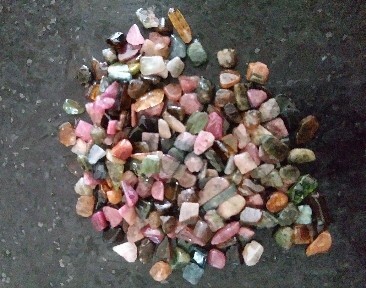 Below is a list of attributes and uses for the specific colors of tourmaline. Tourmaline is the Zodiac stone of Libra.